Looking for a New Volvo V90 in your area? 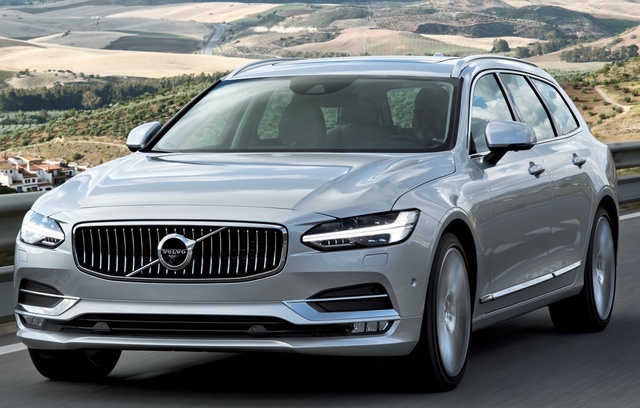 CarGurus has 298 nationwide Volvo V90 dealers with 1,209 new car listings. The Volvo V90 was introduced for 2017 as a brand-new model, although it made a two-year appearance in the Volvo lineup back in 1997. That’s a twenty-year gap, and the current V90 is a considerably different vehicle than its predecessor. The 2018 V90 wagon has room for 5 passengers and comes with a choice of two trim levels (the R-Design and the Inscription), two engines, and either front-wheel (FWD) or all-wheel drive (AWD). There's also the V90 Cross Country, an off-road variant with more rugged wheels, a higher ground clearance, and skid plates. The V90 wagon was built to accommodate a variety of cargo-hauling needs and seating configurations, with rear seats that split-fold 60/40 for a flat load floor and can be operated with a touch of a button in the cargo area for easier loading. Total cargo capacity stands 25.5 cubic feet with the seats upright and 53.9 cubic feet with the seats folded flat. A hands-free power tailgate is included across the lineup and offers programmable height adjustment to handle limited garage roof heights. The base variant of the 2018 V90 is the T5, which is available only with FWD and the less powerful of the two engine options. The sporty T5 R-Design trim has a starting price of $49,950, while the more luxurious T5 Inscription starts at $51,950. T5 variants feature a turbocharged 2.0-liter direct-injected 4-cylinder engine mated to an 8-speed automatic transmission for an output of 250 hp with 258 lb-ft of torque. Paddles shifters are standard on the sporty R-Design and optional on the Inscription. Those craving a more powerful wagon should consider the V90 T6, which not only receives a beefier engine but is the only way to get AWD. The T6 R-Design starts at $55,950, with the T6 Inscription coming in at $57,950. T6 variants have a turbocharged and supercharged 2.0-liter direct-injected 4-cylinder engine paired with the same 8-speed automatic transmission and good for 316 hp and 295 lb-ft. Every V90 also includes a drive mode selector with Comfort, Eco, Dynamic, Off-Road, or Individual settings that adjust the engine, transmission, and air suspension for current road conditions. With either engine choice, the V90 R-Design and Inscription trim levels come with a plethora of standard features. The R-Design leans towards sporty styling inside and out, with paddle shifters, 19-inch 5-spoke alloy wheels, an R-Design perforated-leather steering wheel, a charcoal headliner, metal mesh inlays, and sport pedals. The R-Design sport seats come in nubuck and leather, and the cabin features R-Design dual integrated tailpipes, front spoiler, grille, leather gearshift knob, floor mats, and even key fob. The Inscription adds elegance and luxury to the V90, with linear walnut wood inlays, ventilated front seats with power side bolsters and seat cushion extenders, rear side sun shades, Nappa leather upholstery, 19-inch 10-spoke alloy wheels, and a unique Inscription front grille and exterior trim details. Additional standard features for both V90 trim levels include a panoramic moonroof with a power sunshade, integrated roof rails, and 10-way power front seats with 4-way power lumbar and driver’s seat memory. The Sensus infotainment system features a 9-inch touchscreen with AM/FM and a 6-month SiriusXM satellite radio subscription. Sound comes courtesy of a high-performance 10-speaker audio system, USB and Aux inputs and Apple CarPlay and Android Auto capabilities. If safety is at the top of your list, then the 2018 V90 has plenty to offer. True to Volvo standards, it comes well-equipped with all the latest technology, such as active bending lights with LED headlights, Thor’s hammer daytime running lights, and automatic high beams for the exterior. Driver-assistance features include adaptive cruise control with the semi-autonomous Pilot Assist driving system, a blind-spot information system with cross-traffic alert, a collision avoidance system, driver alerts, rear-collision warning, road-sign information, a reversing camera with rear parking assist, and run-off road mitigation. Optional safety features include a 360-degree surround-view camera, Park Assist Pilot with front park assist, and a graphical head-up display to help keep the driver’s eyes on the road. What's your take on the 2018 Volvo V90? GuruRF59 I LOVE Volvos, I drive my Volvo more than my Mercedes, its just a great car and I have the Cross Country Wagon, I feel so safe and untouchable LOL!!!! Have you driven a 2018 Volvo V90? Enter your zip to see incentives for a new V90 in your area. 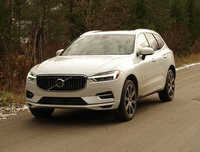 CarGurus has 499 nationwide V90 listings starting at $36,995.